Angy Eiter and her boyfriend Bernie spent Easter in Spain, during their stay Angy sent ‘Era Vella’ in Margalef (her third 9a). 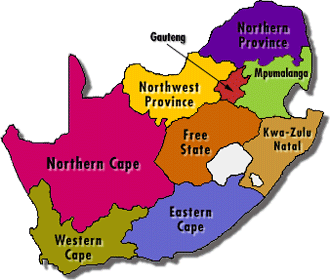 This is how it all began…! Check out this short made by 3StringsMedia on how Sasha DiGiulian became a professional rock climber! 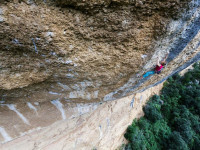 Sasha DiGiulian and her climbing partner Edu Marin relocated their mission to the Italian island of Sardinia and the seven pitch ‘Viaje de los Locos’ (8b+/5.14a). 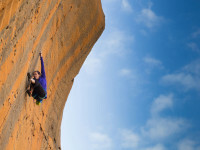 In August, Sasha DiGiulian and Spanish climber Edu Marin repeated Bellavista. 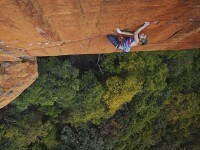 Sasha Digiulian on the first ascent of ‘Rolihlahla’ at Waterval Boven. The Psicobloc Masters Series finals were held on Friday, August 2, 2013 in front of a crowd of over 2,500 people watching Sasha DiGiulian place first in the women’s divisions and Jimmy Webb place first in the men’s division. 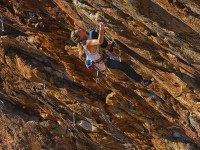 Sasha DiGiulian sent the open project at The Pipeline in Bad Kloof, Montagu. The visiting American girls (Paige Claassen and Sasha DiGiulian) have been ticking off Andrew Pedley’s open projects at Waterval Boven.